If you had these 49 Class A figures and were wanting to sell them, what would you do? As we saw in Auction Watch #240 the first lot had 26 Class A figures (including the 3 doubles, so not 29) which worked out to an average of $78.99 per figure. I agree with University of Muscle that exactly 5 of those figures would command $100 price tag on their own. Take out those 5 at let’s say, $150 each and you have $750 off the price tag. You are then at roughly $1300 for the remaining 21 Class A figures at an average of $61 per figure. I feel in this case the seller got themselves a good chunk more dollars than if they had sold the figures separately. So a win for the seller and selling figures as a lot in this case. 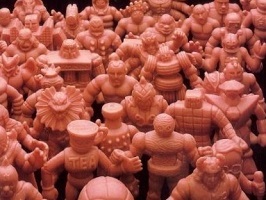 I believe this kind of auction would not be bid on by most M.U.S.C.L.E. collectors though, myself included. I personally didn’t even look at it as I own more than half of the figures. Outlaying that kind of money to then try and sell the other half is not in my DNA. Well done on this seller for cashing in. The second lot though has a much different story. Firstly, I believe the price expectation was lowered by the seller having very little feedback and rumored to be owned by a certain M.U.S.C.L.E. collector. So the final price according to the University is $940 for 9 Class A figures works out to be an average of $104.40 per figure. This is actually a higher average than the previous auction. Again, lets take out the figures that would command $100 plus of which there are 4 here. There are some that will say the Purple #107 sold for over $1000 on its own which is a stupid amount in my opinion and sits in the same range as a Purple #15 at about $200. MRT certainly came into play on that one. So lets average $200 for the 4 figures and you’re left with $140 for the remaining 5 figures, averaging $28 each. Certainly a lot cheaper than the average on the first auction. Now then, does the seller win in this case? Probably as there is no feedback left and therefore no one is sure the figures have actually changed hands. That aside, selling separately would have most certainly made this seller more money in my opinion. So if there is a legitimate buyer for these figures then they got themselves a good deal. Again, I still believe a large percentage of the small amount of M.U.S.C.L.E. collectors would not have bid on this auction. I think the single figure auctions win in this case. So, we are at 1-1 in the debate which brings me to the picture at the top of MMMM this week. If you had these 49 Class A figures, would you sell in a lot? Yes, there are 49 in this lot as opposed to 26 and 9 in the other 2 lots so there would be more money than those 2 overall I would think. Then, lets look at how many would sell for over $100. In this lot there would be 6 in my opinion. There are many more that would sell for under or around $20 each. Looking at that stat I would lean towards selling as a lot and hoping the top 6 would drive the price of the lot up. 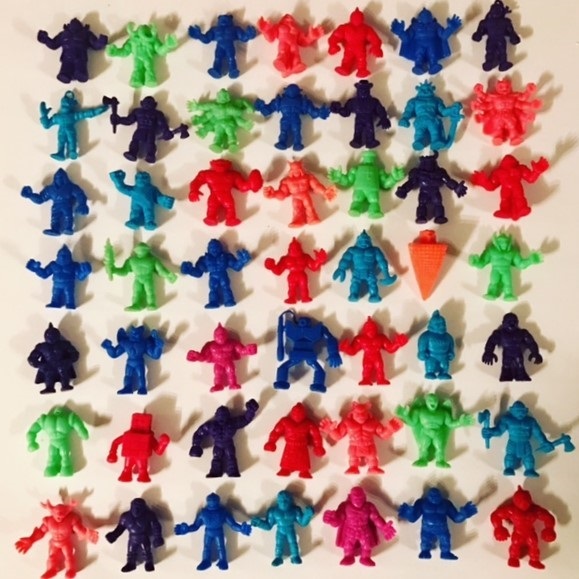 I’d be curious to know how many members of the small M.U.S.C.L.E. community would bid on a lot of 49 Class A figures. I for one wouldn’t and so my personal decision would be to list auctions starting at .99c per figure. This would then give documented pricing for single figures to be used as a guide next time one such figure appears. As much as I hate single figure auctions, this scenario would benefit the entire community. In a lot situation we have no idea how a collector values certain figures of desire and no pricing guide. Would love to hear comments below and please vote on the poll question. Would you sell 49 Class A figures as #1 a lot or #2 separate listings? This entry was posted on Monday, February 19th, 2018 and is filed under UofM News. You can follow any responses to this entry through RSS 2.0. You can skip to the end and leave a response. Pinging is currently not allowed. I think it is a difficult question to answer because there are three parts to it: (1) buyer; (2) seller; and (3) exorbitance. As a buyer, I want separate lots. It gives me the best chance to win the figure I need – spending exactly as much as I value owning the figure. As a seller, there are some duds in that lot. It benefits me to lump some of the weak with some of the strong – which will drive the price up. Buyers have to guess what other people are saying the duds are worth. And finally, I think there is an issue of exorbitance. With 49 Class A figures, plus some really nice ones, buyers might imagine the final price will be too high to even bother. This hurts buyers and the seller. If I was selling them, then I would break them up into lots of 7 or 8. With each lot anchored by one of the more desirable Class A figures.